A-TRAC is activated if wheel skid is detected while the transfer is in the L4 position. L4 detection switch signal input to skid control ECU (master cylinder solenoid) does not match L4 detection switch signal output from ECM. When DTC U0114 is output together with DTC C1268, inspect and repair the trouble areas indicated by DTC U0114 first (See page ). (a) Turn the 4WD control switch (transfer position switch) to L4, and then drive the vehicle and check that there are no problems with the touch select 2-4 and high-low system. There are no problems with the touch select 2-4 and high-low system. (a) Connect the S1 skid control ECU (master cylinder solenoid) connector. (b) Turn the 4WD control switch (transfer position switch) to L4. 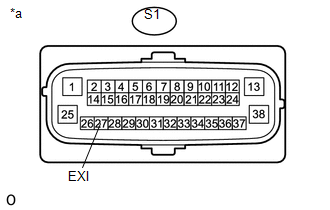 (c) Disconnect the E13 ECM connector. (d) Disconnect the S1 skid control ECU (master cylinder solenoid) connector. (f) Reconnect the S1 skid control ECU (master cylinder solenoid) connector. (g) Reconnect the E13 ECM connector. (h) Turn the 4WD control switch (transfer position switch) to 2WD or H4. (i) Disconnect the E13 ECM connector. (j) Disconnect the S1 skid control ECU (master cylinder solenoid) connector. (k) Measure the voltage according to the value(s) in the table below. (b) Reconnect the S1 skid control ECU (master cylinder solenoid) connector. (c) Reconnect the E13 ECM connector. 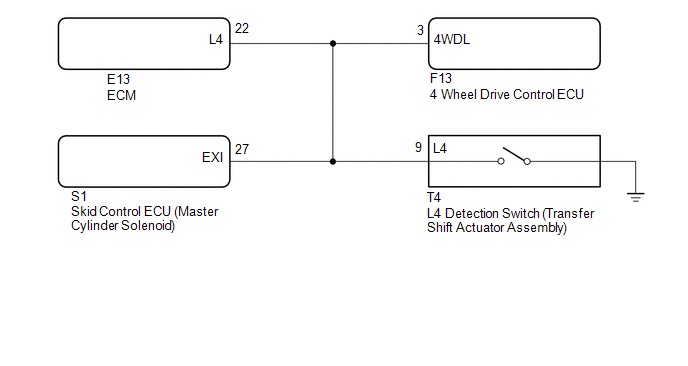 (i) Turn the 4WD control switch (transfer position switch) to L4, drive the vehicle, and then check for DTCs.